One of the original Freedom Chair Trailblazers, Nerissa is now GRIT's Community Manager! Her own journey with chronic illness has made her very passionate about helping other people get the most out of life in spite of a disabling condition. The GRIT Freedom Chair is in its element outdoors on rough terrain. That is undeniable. It's called an "All-Terrain Wheelchair" for a reason! However, one of my favorite features of the Freedom Chair is how seamlessly it transitions from outdoors to indoors. 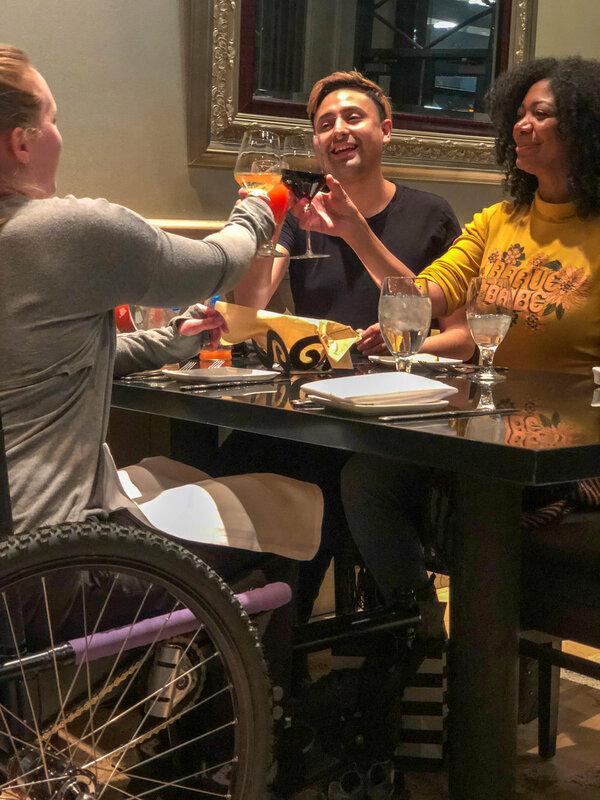 The Freedom Chair has been designed to fit into all ADA accessible spaces. This means you can go about your day, and tackle whatever crosses your path with only one piece of equipment! I’ve taken my GRIT Freedom Chair out to all sorts of eateries. Whether it was patio, indoor casual, or upscale, the Freedom Chair has "fit" right in. The front wheel easily rolls under most of the tables I've encountered. Sometimes I need to ask someone to help me move a chair out of the way, but that's not a big deal. I love that I can go right from an adventure to grabbing a drink with friends without having to worry about bringing two chairs along. 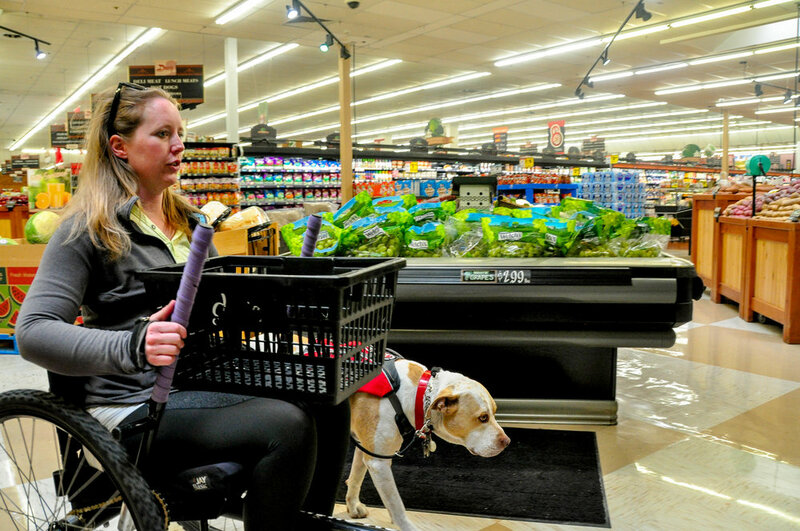 Grocery shopping really is a breeze with the GRIT Freedom Chair. Because I wouldn't normally shop for more than I can fit into my backpack, I don’t need to worry about handling a cart. I simply place the “hand-held” shopping basket on my lap and go about my business. Most grocery stores these days have nice, wide aisles and lots of space between displays. Often, I don’t even have to remove my levers at all! 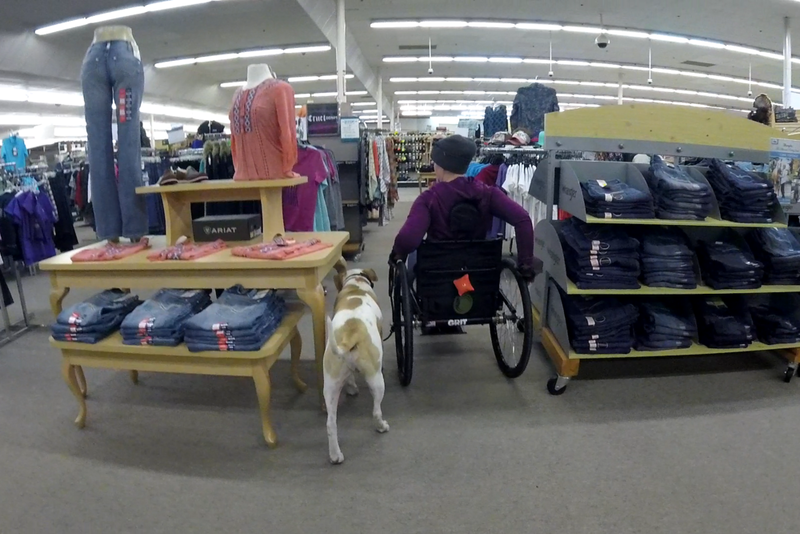 If it’s busy I will just have to have quicker maneuvering ability, but that’s mostly as a courtesy to other shoppers. Don't forget, you can always use the levers to WHACK down out of reach items. 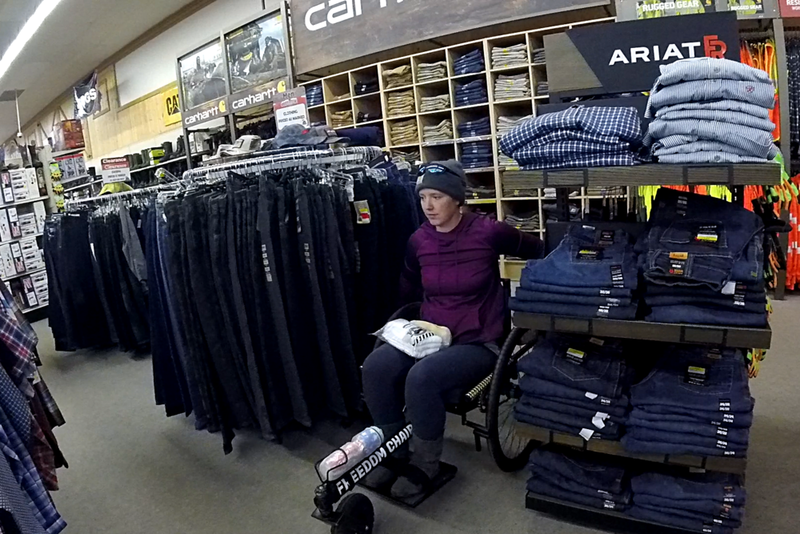 Even in my ultralight, sometimes clothes shopping can be tricky because a lot of stores like to place racks closer together than ADA standard. However, as long as I remain spatially mindful, I’ve been able to browse all throughout without getting snagged or stuck! As yet, I’ve never had an issue going into the fitting rooms when I’ve wanted to try something on. In my experience, most places have very generously sized accessible fitting rooms. The only challenge with this is I never have an excuse to NOT try on something I like, so I end up spending more than I would otherwise! Going on a trip often means a lot of walking - or in my case, rolling. The Freedom Chair is great for tackling long distances, broken up sidewalks, curbs, and other outdoor obstacles. However, once you get to your destination you can still get inside, use the restrooms, take the elevator, and even browse the gift shop! Here I am exploring the some of the sites along the Freedom Trail in Boston. These are just a few of the indoor places where I've used my GRIT Freedom Chair. I've spoken with many other riders in our community who have told me about their experiences using their chairs in museums, movie theaters, and more. Here's to more adventures, both on and off the pavement!